Ian Brown's musical life covers a wide field of solo playing, chamber music and conducting. Ian Brown made his London debut as a conductor in a performance of Mahler's "Resurrection" Symphony in the Barbican. He has conducted the London Mozart Players, The English Chamber Orchestra, the Bournemouth Symphony Orchestra, The Northern in Sinfonia and the Scottish Chamber Orchestra. 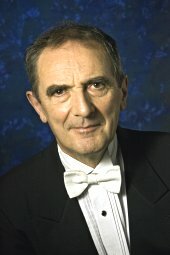 He has worked in Poland with the Leopoldinum Orchestra of Ostrava. He has appeared at the Edinburgh, Israel and Cheltenham Festivals and conducted a Peter Maxwell Davies premier at the Orkney Festival. Last season he conducted the Philharmonia Orchestra in Bruckner's 7th Symphony and directed Beethoven's First Piano Concerto from the keyboard. This year, he conducts four concerts with them, with Min-Jin Kym as soloist. They will include the summer festivals in Chichester and Fishguard. Next year, he is touring with the Academy of St Martin in the Fields, with Joshua Bell and Steven Isserlis as soloists. He is also building a relationship with the Stuttgart Chamber Orchestra as both conductor and soloist in Mozart and Mendelssohn piano concertos. They played in two consecutive years at the Marburg Festival as well as giving concerts in Stuttgart and around Germany. He is Music Director of the Henley Symphony Orchestra and has worked with distinguished soloists, among them James Galway, John Lill, Steven Isserlis and Jean Rigby.